Spring Colors Sewing Set [C5316] - $22.00 : Yarn Tree, Your wholesale source for cross stitch supplies. Cross Stitch pattern from Mani di Donna. 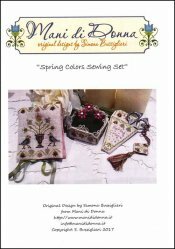 Looking for a sewing set to stitch for spring? This is just the pattern for you! This design features spring flowers & singing birds! Included with this design are the instructions for the pincushion, scissor case, thread pocket & scissor fob. Stitch count is not listed.